Happy Holidays from Of Corgis & Cocktails! ridiculous dog outfits from target. i think the collar used to be the guinea pigs, actually. What adorable pictures! I love your skirt too, so festive! Hope that you have a wonderful holiday! Beautiful!! I love your pictures! Happy holiday to you and your lovely family!! These pictures are all sooo awesome, I have a collection of pictures of me and Mr. Duke that are our "christmas" card. You have such a cute little family. I love your sparkly skirt, so perfect for the holidays! our little family is too cute! love your skirt :) happy holidays! Aw you two look so cute and festive! I love the dog outfits too. Such a cute family! Perfect holiday pics...love the sparkle and bright collars, looks so festive and happy! merry christmas katherine! those are fabulous christmas pics. love your sparkly skirt, printed tights and blue sweater. festive FUN! Hi Katherine! Sorry I haven't been around for a while. Such a sweet Christmas card and that outfit is fabulousss. I've spent a while catching up on all your posts and fun outfits, you have some sparkly details that have me drooling! You and Jason seem to be spending some great quality time together. Merry Christmas to all of you, hope it's great! LOVE the tights and skirt, oh my! What super cute family photos :) So sweet & inspiring, Katherine! This is so adorable. I am so happy to see you and your hubbie in this photo! Merry Christmas Katherine! I hope it goes without saying that I love your sparkly skirt and tights! I'm dying at how adorable you guys are. Cutest family out there? I think so. 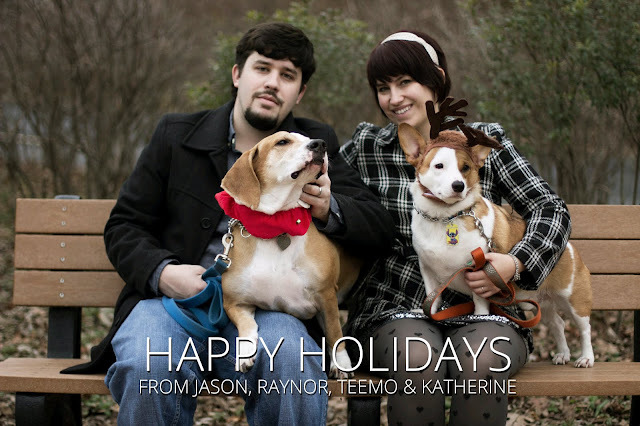 Teemo's antlers definitely take the cake! You and your husband and your dogs are too cute! These pictures are so pretty! I love the whole family being in them!!! Yey!!! Oh gosh, this is precious!